The Derrington W.I. Herb Garden is a fabulous practical example of creativity, team work, care for the environment and growing food locally! This is its story as told by W.I. President, Mrs Margaret Merrick. 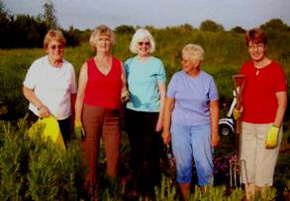 ‘In 1999, Derrington Women’s Institute was invited to join in with the Derrington Millennium Green project, to celebrate the year 2000. 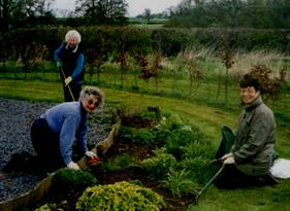 We agreed to create a Herb Garden and were allocated a plot of ground in the far corner of the Green, which at that time was very overgrown! 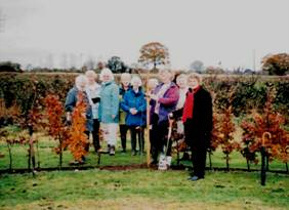 It was a daunting task … but after much hard work, the site was cleared and levelled, and in November 1999 the Copper Beech border hedge was planted. 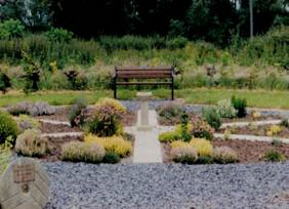 In March 2000 the Herb Garden pathways were installed, followed by the laying of slabs to divide the garden into segments. Herbs were then planted in the newly dug borders, some grown from cuttings and some donated from gardens. was passed in 1927, calling for action to prevent pollution of our seas. Since then, sustainability issues such as climate change have been an important part of W.I. campaigning. Women have a unique opportunity to make a difference to the environment, within their families, communities and society as a whole.They can make ‘greener’ choices – in what they buy, how they travel, the energy supplier they select, or the food choices they make. Women are also key educators, able to help children to understand and celebrate our beautiful planet, and to think about how we can all enjoy, protect and care for the world around us. Derrington Women’s Institute was started before the Second World War, but forced to close due to war restrictions. It re-opened in 1951 and still continues to flourish.